When someone is sued in a Florida court for damages based upon libel or slander, there may be a law on the books that blocks their adversary from winning their case: it is the “Citizen Participation in Government Act,” commonly known as Florida’s Anti-SLAPP Law. The Florida Legislature has passed a law that provides a defense to people who have been sued for libel, slander, or defamation in certain situations. It’s called an “anti-SLAPP” law and Florida is one of many states to have passed this kind of statute. There’s also been attempts to have the federal government enact a federal version of this law, to have a federal “anti-SLAPP” statute passed by Congress. What is an Anti-SLAPP Law? Florida’s anti-SLAPP statute deals with defamation claims. Defamation occurs when someone makes a statement, either written or oral, that injures or harms a third party’s reputation. See, e.g. Masson v. New Yorker Magazine, Inc., 501 U.S. 496 (1991). The tort of defamation includes both libel and slander. 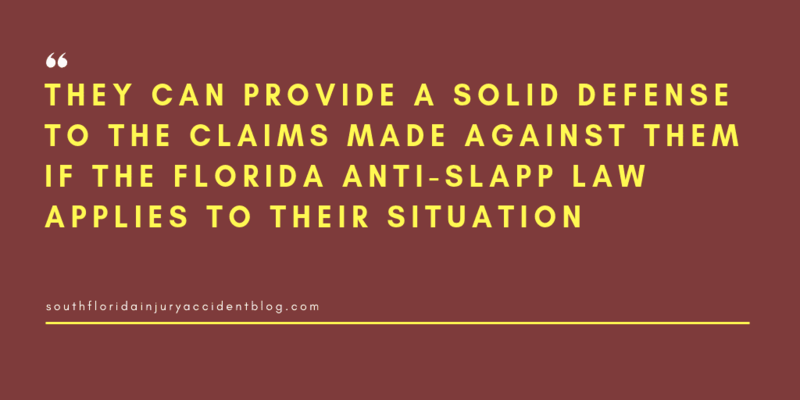 When someone is sued for defamation, then they can provide a solid defense to the claims made against them if the Florida Anti-SLAPP law applies to their situation and they plead and prove its application in the case. Essentially, both federal and state laws here in Florida protect a person’s right to speak freely on public issues as well as to petition the government for a redress of grievances. When the government becomes a plaintiff in a defamation lawsuit, suing people (or groups) for their exercise of these constitutionally-protected rights, it is often considered to be a lawsuit filed to block or thwart action not favorable to the governmental plaintiff. These suits are known as “SLAPPs,” or “Strategic Lawsuits Against Public Participation.” States like Florida have responded by enacting “anti-SLAPP” laws. The term “strategic lawsuit against public participation,” or SLAPP, describes a civil claim or counterclaim in which the asserted injury to the filer arises from the other party’s act of petitioning government or speaking out on a matter of public concern. One of many possible scenarios might involve a person speaking out against a development project at a governmental regulatory meeting. A proponent of the project might sue for defamation or interference with a business advantage in an effort to silence the person or entangle him or her in lengthy litigation, rather win damages for actual injuries. Because a lawsuit is expensive to defend, the person opposing the project may capitulate. Concern that these lawsuits may have a chilling effect on free speech has led multiple states to enact anti-SLAPP legislation over the years, providing various levels of recourse for defendants. Florida has an anti-SLAPP statute relating solely to governmental plaintiffs. The Citizen Participation in Government Act prohibits a governmental entity from filing a lawsuit without merit and solely because a person has exercised the right to assemble and the right to petition for redress of grievances before a governmental entity. Florida also has anti-SLAPP provisions relating to homeowners’ associations and condominium associations which prohibit certain lawsuits that are filed solely because a parcel owner or unit owner has addressed a governmental entity. The prohibitions against filing the lawsuits in the homeowners’ association or condominium association context apply to business organizations and individuals, as well as to governmental entities. Note: There is another anti-SLAPP law on Florida’s books: it deals with the specific circumstance of homeowner’s associations in the State of Florida. That statute can be found at Florida Statutes 720.304. In 2015, the Florida Legislature amended the law by adding more protections. Under the amendment, courts have the ability to dismiss cases very early in the proceedings if the defendant can prove that the lawsuit has been filed as a means to pressure or intimidate someone’s statements on public matters. The 2015 amendment expands the speech that is protected and it provides the SLAPP laws do apply to private plaintiff lawsuits. A good piece of advice if you have been harmed by defamation, is to speak with an experienced defamation lawyer before you file a claim to learn about some of the issues that can arise with these claims, including the type of evidence needed to prove a claim and the type and amount of damages you can recover. Most defamation lawyers, like Alan Sackrin, will offer a free initial consultation (over the phone or in person) to answer your questions.